Watercolour by David Allan – £2000 at Moore Allen & Innocent. An unsigned 18th century watercolour with an attribution to the Scottish genre painter and illustrator David Allan (1744-96) made £2000, many times its £100-150 estimate, at Moore Allen & Innocent in Cirencester on April 5. Alloa-born Allan made many lively drawings of street life in Rome and Naples as well as his native country. 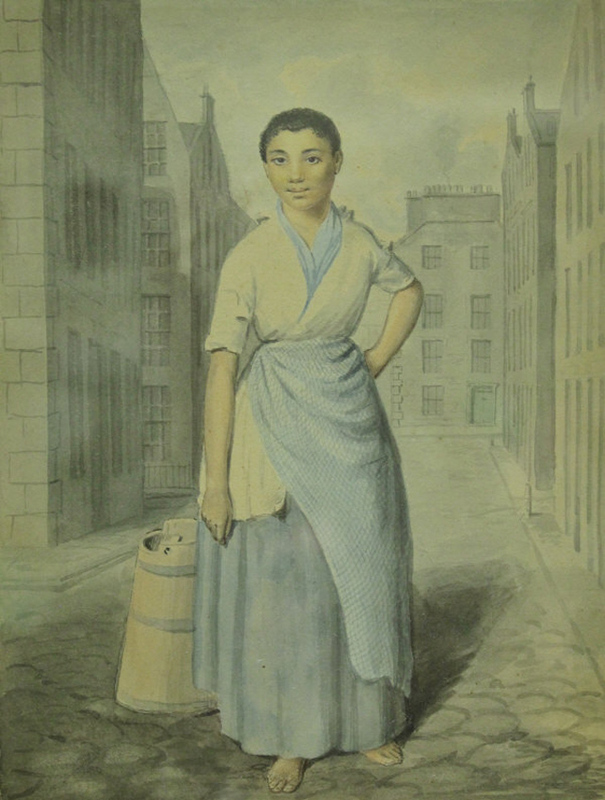 Much of the attraction of this small work appears to have been the subject matter – the ‘Edinburgh servant standing in a street’ being a girl of African descent. 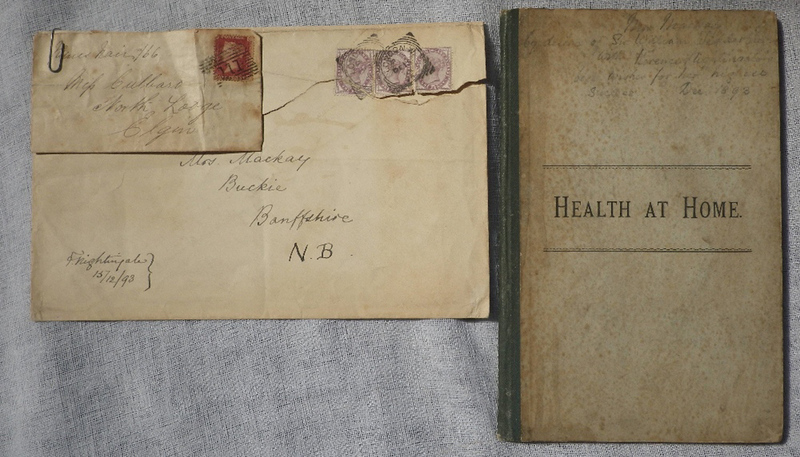 A report titled ‘Health At Home’ sent and inscribed by Florence Nightingale – £2200 at Duke’s. A copy of Health At Home, a report by Buckinghamshire County Council on ‘The Training of Rural Health Missioners and of their Village Lecturing & Visiting’ dated 1891-92, includes an ink inscription from the founder of modern nursing. It reads To Mrs Mackay, with Florence Nightingale's best wishes, for her plans for health teaching to the rural poor this little pamphlet on Health Missioners is sent by Sir Wm Wedderburn’s desire, December 15th 1893. Estimated at just £40-80, at Duke’s Grove Auctions on April 9 it sold to a buyer via thesaleroom.com at £2200. While some recent commentators have suggested Nightingale's Crimean War achievements may have been exaggerated at the time, all agree on the importance of her later work in professionalising nursing roles for women and in sanitary reform. As the leading figure in the introduction of improved medical care and public health service in India, she befriended Sir William Wedderburn, 4th Baronet (1838-1918), a Scottish civil servant in India and later Liberal MP for Banffshire – where the ‘Mrs Mackay’ who received this pamphlet lived. Meanwhile, Dorset auction house Duke’s also sold a major piece of George I furniture for £120,000 this week. 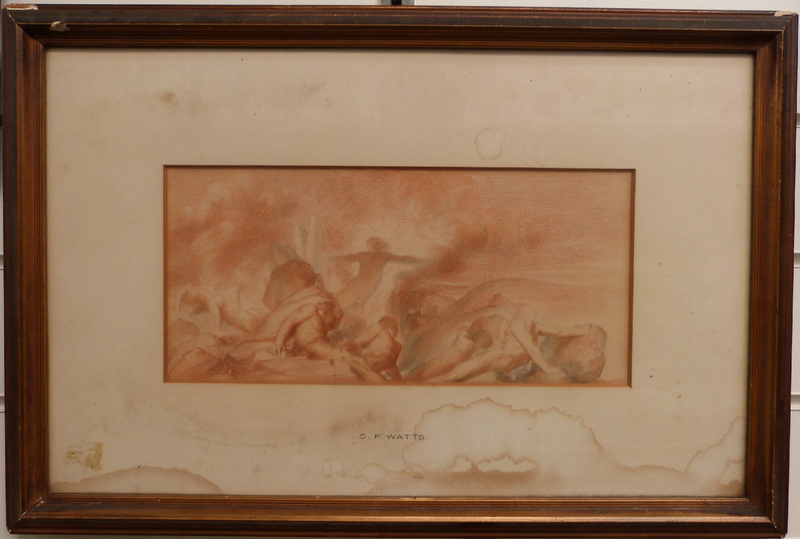 Sketch attributed to George Frederick Watts – £2200 at Stroud Auctions. Attributed to George Frederick Watts (1817-1904) and estimated at just £30-50, a 6 x 13in (14 x 33cm) red chalk sketch sold for £2200 at Stroud Auctions on April 3. The drawing, with a label verso for the Bond Street dealership J Leger & Son dated July 1959, appears to be a study for the figures of giants in the left foreground of Watt’s early symbolist painting Chaos (c.1875-82) in Tate Britain. Chaos is represented by the giants who are struggling to free themselves from the elements of fire and vapour. 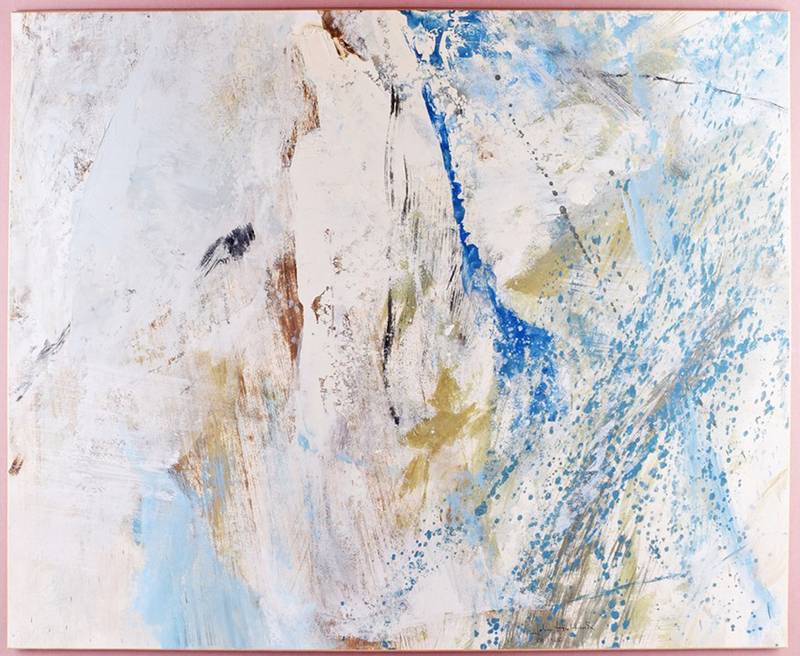 ‘White Afternoon’ by John Hubbard – £6400 at Dawson's. Estimated at £300-500 by Dawson’s in London on April 7, this Abstract Expressionist oil on paper board by John Hubbard (1931-2017) made £6400. Born in the US, Hubbard attended Harvard and fought in the Korean War but later lived and worked in Dorset for over 50 years after 1961. White Afternoon dates from 1965 during his early years in England when he was working at the Camberwell School of Art. It sold to an online buyer via thesaleroom.com. ‘Head of a Woman’ by Stepan Dmitrievich Erzia – £31,500 at Dawson's. 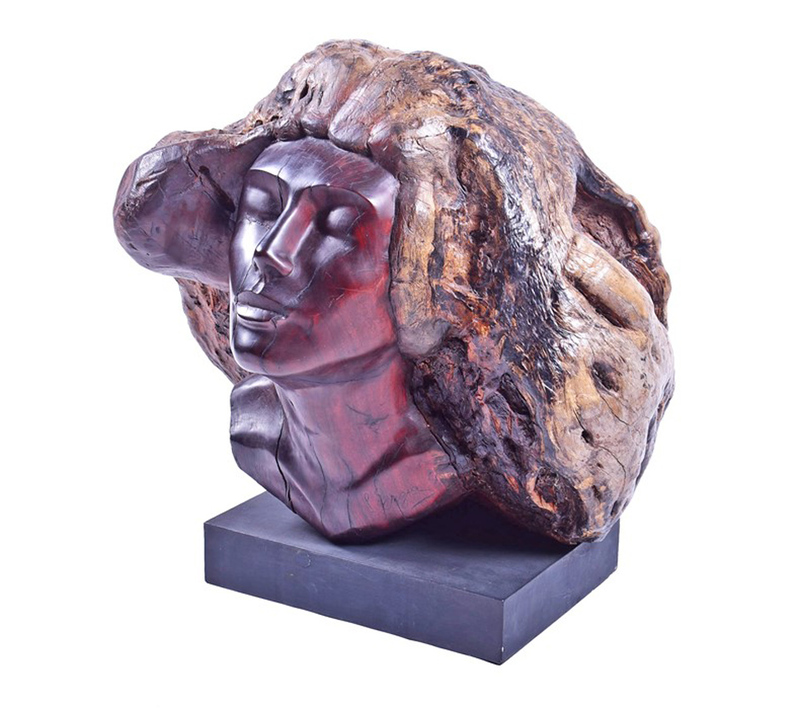 Also offered at Dawson’s April 7 sale was Head of a Woman, a sculpture carved from quebracho wood by Soviet artist Stepan Dmitrievich Erzia (1876-1959). It was estimated at £30,000-50,000. After being sent abroad to “spread knowledge of Soviet art”, he settled in Argentina in 1927 where he remained until 1950. It was there that Erzia developed methods of working extra-hard native woods such as quebracho for his expressive figures. Although different in style to his more formal sculptures of Lenin, Marx and Engels (Erzia was awarded the Order of the Red Banner of Labour in 1956 on his return to Russia), this work had its admirers and sold to an online buyer on thesaleroom.com at £31,500.